Yuri Petrovich Vlasov is holder of four world championship titles in weightlifting and the author of the books "Red Jacks", "To Overcome Oneself", "The Right of Might", "White Instance", "To Believe", "Salt Joys", "Fiery Cross" (an epic novel in three volumes) and "Who Runs the Show" (a collection of articles, 1983). He is a contributor to the newspapers Pravda, Sovetskaya Rossiya, Literaturnaya Rossiya, and Zavtra. 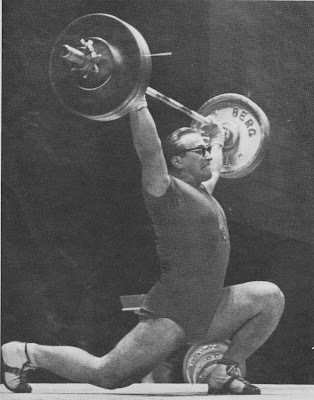 Yuri Vlasov went to the 1964 Summer Olympic Games in Tokyo a heavy favorite to win the gold medal for weightlifting in the heavyweight class. A gold medal winner in the 1960 Olympics in Rome (total – 1184¼ lbs. ), he had everything going for him. He was excellently built, extremely strong, and well educated. By profession, Vlasov was a radio engineer. His hobby was writing, which is something unusual particularly among competitive sportsmen. He had just published a collection of short stories, “Overcome Yourself.” This book was included as part of the Soviet weightlifting team’s equipment and made an excellent present for Yuri’s fans. Although few people in Tokyo could read Russian, the Olympic champion’s book went like hotcakes. The results of the 1964 Olympic weightlifting competition appeared to be a foregone conclusion with respect to the heavyweight class. Vlasov had just set two new world records and was expected to take his weight class easily. Two Soviet radio newsmen were on hand to record an on-the-spot account of the contest. To the accompaniment of falling metal bars, they proceeded with background material on Vlasov’s life and training. They were so certain that he would capture another gold medal. Now, the results are too well known. 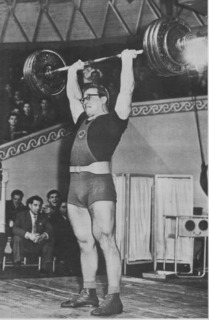 Vlasov lost, and the gold medal went to Leonid Zhabotinsky who lifted a total of 1259½ lbs. People were left with a feeling of surprise and even outrage. Did Vlasov give up after his first loss? As the title of his book says, did he fail to overcome himself? Whatever the cause, his last competition was in the 1964 Olympics. In 1968 the Olympics were held in Mexico City, and Vlasov’s world records (altogether he set 28) had been broken, but he is still remembered as one of the giants of weightlifting, and many people have asked what he is doing now. ”And what about weightlifting? Have you really given it up?” questioned Zhiltsov. “Things might have been easier had you retired undefeated,” remarked the reporter. “No, indeed! I shall never regret it!” Yuri said emphatically. “Weightlifting gave me the greatest of all joys – the joy of victory. Training sessions are all plans, schedules, and tons of metal lifted and dropped. Victories gave me an incomparable feeling, and I shall never forget those exhilarating contests. I was attracted to weightlifting because I wanted to become a strong man. There is an exciting, creative side to weightlifting. You can experiment and use yourself as a guinea pig, and you can strength and muscle grow, but that alone, without competition, is not very satisfying. I set all my records at competitions and never lifted a record weight in training. For that I am grateful to my coach and to Professor Lev Matvejev who put our own haphazard experiments on a scientific basis. “Yes, partly. It may be my last work about weightlifting. I’m ready now to move on to other subjects. I’ve done a lot of work for a story I want to write about the Russian revolution as seen through the eyes of a monarchist officer. I have been to Paris where the prototype for the character lives. I worked a lot and collected a great deal of material. I have built up a splendid collection of books on the Russian revolution.